Burke’s Landed Gentry by Burke’s Peerage LTD. Released from the 19th century to the present day (19th Edition Volume II has just been released). A combination unofficial guide, genealogical compendium and social register. Not always accurate. Earliest editions are especially suspect, and though now much more carefully edited, family legend is given as early generations for many families. Landed West Country and Mid-land Bassetts are included in various editions through the edition published in 1939. Other Bassets families, having married into landed gentry families, are also named. Burke’s Peerage and Baronetage by Burke’s Peerage LTD. Released in numbered editions from the 19th century to the present day (107th edition released in 2005 said to be the final printed version; updates will continue on the Internet at www.burkes-peerage.net by subscription). A combination unofficial guide, genealogical compendium and social register. Evolved from historical and antiquarian writers’ works on the leading families of Great Britain and Ireland into the best known reference of its kind. Not always accurate; earliest editions are particularly suspect. Now much more carefully edited. Bassetts, especially the West Country gentry, are included as relations of peers. No Basset peers or baronets are included, as all Basset titles became abeyant or extinct before publication of the series began. The Complete Peerage or a History of the House of Lords and All Its Members from the Earliest Times by G. E. Cokayne et al. First Edition 1884-1898. Second Edition 1910-1959, with Addenda and Corrigenda in 1998. 14 volumes in 15. Reprint in print. The definitive guide to individuals who served in the House of Lords of England, Scotland, Ireland, Great Britain and/or the United Kingdom. Short biographies with pertinent events and documentary references. Includes some detail on ancestors (where known) and marriages, as well as all children that succeeded them. Other children are referenced when they are themselves peers or the spouses of peers. There are in essence four Basset peerages. Three are medieval, having been baronies prior to the establishment of Parliament; their descendants were subsequently summoned as Lords Basset of Weldon, Lords Basset of Drayton, and Lord Basset of Sapcote. Each is now either abeyant or extinct. The fourth, established in the 18th century, was a combination of titles known generally as Lord Basset of Stratton, created for Sir Francis Basset of Tehidy, passed to his sole legitimate daughter, then extinct. These are recorded in Volumes II and XIV of the series. 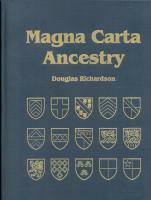 Magna Carta Ancestry: A Study in Colonial And Medieval Families by Douglas Richardson. Published by the Genealogical Publishing Company, 2005. Large-sized hardcover, xxxv + 1099 pages. ISBN 0806317590. In print; available from the author at www.royalancestry.net and through new booksellers elsewhere. Documents the descent of American colonial immigrants from 17 of the original 25 Magna Carta sureties (the other 8 have no descendants past the 4th generation, or have no known family). Each generation’s narrative genealogy details the ‘official’ life of the individual, much as is done for entries in The Complete Peerage. Also includes each generation’s know children, with marriages, and some coats of arms. Citations follow each entry for primary and secondary sources, referencing back to a 94 page bibliography. 25 Bassets are referenced, as are hundreds of Basset ancestors and probably as many non-Basset surnamed Basset descendants. This volume is as useful to other descendants as to Americans. 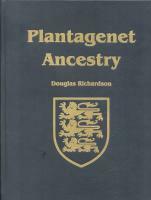 Plantagenet Ancestry: A Study in Colonial And Medieval Families by Douglas Richardson. Published by the Genealogical Publishing Company, 2004. Large-sized hardcover, xxix + 945 pages. ISBN 0806317507. In print; available from the author at www.royalancestry.net and through new booksellers elsewhere. Documents the descent of American colonial immigrants from Geoffrey Plantagenet, Count of Anjou, father of Henry II, King of England. Each generation’s narrative genealogy details the ‘official’ life of the individual, much as is done for entries in The Complete Peerage. Also includes each generation’s known children, with marriages. Citations follow each entry for primary and secondary sources, referencing back to a 78 page bibliography. 11 Bassets are referenced, as are hundreds of Basset ancestors and probably as many non-Basset surnamed Basset descendants. This volume is as useful to other descendants as to Americans. Royal Descents of 600 Immigrants to the American Colonies or the United States Who Were Themselves Notable or left Descendants Notable in American History by Gary Boyd Roberts. Published by the Genealogical Publishing Company, 2004. Mid-sized hardcover, ci + 811 pages. ISBN 0806317450. In print. Contains lines of descent with general source notations. Names Basset ancestors of the Deightons and Dudleys (of Massachusetts), William Henry Harrison (9th US President), Benjamin Harrison (23rd US President), Henry Sewall (Secretary of Maryland Colony), the Shirleys (Governors of New York Colony), Rev. John Davenport (founder of the New Haven Colony), the Howes (of Massachusetts), and the descendants of Henrietta de Beaulieu, known as Henrietta Johnson, “first woman painter in America”, among others. The True Use of Arms by William Wyrley (or perhaps Sampson Erdeswick). Originally printed for the author in 1592, reprinted by John Bell in 1853. Out of print. Contains a section on differencing of arms prior to the adoption of the “English System of Cadencing” and uses arms from various branches of the Bassett family as illustration. One of the earliest printed documentations of Bassett heritage. Color illustration of the arms.